Toronto rookie Auston Matthews is one of several players to have memorable debuts in the NHL. Here's how five other superstars fared in their first career NHL games. 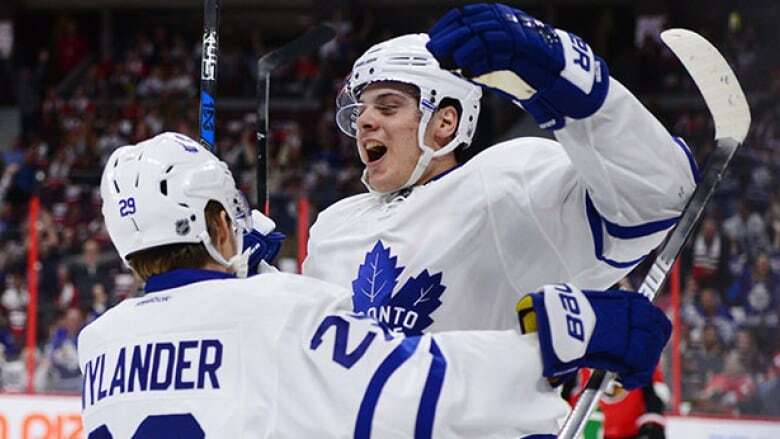 Auston Matthews became the first player in NHL history to score four goals in his regular-season debut as the Toronto Maple Leafs fell 5-4 to the Ottawa Senators in overtime on Wednesday night. Matthews is the fifth player in NHL history to score a hat trick in his regular-season debut and the first in Maple Leafs history. Matthews, 19, was drafted first overall in the 2016 draft and was Toronto's first No. 1 selection since Wendel Clark in 1985. He's one of several players to have memorable debuts in the NHL. Here's how five other superstars fared in their first career NHL game. The No. 1 pick from the 2004 NHL draft was the first Washington Capitals player to score twice in his first NHL game, a 3-2 victory over the Columbus Blue Jackets on Oct. 5, 2005. Ovechkin would score 52 times in his rookie season and captured the Calder Trophy at season's end. The ultra-hyped superstar recorded an assist in his NHL debut on Oct. 5, 2005 — a 5-1 loss to the New Jersey Devils. Crosby, picked No. 1 overall in the 2005 draft, was a minus-two rating in his debut, recording three shots and logging 15:50 in ice time. The Cole Harbour, N.S., native would find the back of the net in his third game against Boston and finished the season with 39 goals and 102 points. One of the greatest players of all time made his NHL debut on Oct. 10, 1979, and recorded an assist in a 4-2 road loss for the Edmonton Oilers against the Chicago Blackhawks. The goal, scored by Kevin Lowe, was the first for Edmonton in the NHL after it joined the league from the World Hockey Association. Gretzky recorded his first NHL goal in his third game and finished the year with 51 goals and 137 points. Like Matthews, Lemieux scored in his NHL debut on Oct. 11, 1984, on his first shift. The Penguins legend would add an assist, although Pittsburgh fell 4-3 to the Boston Bruins. Lemieux was the No. 1 pick in the 1984 draft and finished his rookie season with 43 goals and 100 points. The now-Edmonton Oilers captain had two shots in his debut last fall against the St. Louis Blues but failed to record a point. The No. 1 pick in the 2015 NHL draft logged 18:07 in his first game throughout 22 shifts and was a minus-one rating. His first NHL goal (and first point) came in his third game when he tipped in a shot during a 4-2 loss at Dallas. A shoulder injury sidelined McDavid for a large portion of his inaugural season, but he finished with 16 goals and 48 points in 45 games. What happens to those hat-trick hats?